Senior Adult Ministry at FUMC Allen is open to all those 50+ who desire to share time together through study, fellowship, and social events. From Sunday morning small groups to a variety of social groups, we have many ways to connect the senior adults in our community. The XYZs meet every month during the school year for food, fellowship, support, and entertainment. This group is for senior adults nearing retirement or already retired. Luncheons are the third Thursday of each month from 11:30pm-1:00pm. Contact JoAnn Garlington, 972.727.1223. This group of retired men who meet over coffee and donuts every Wednesday at 10:00am, in the parlor, to discuss timely topics, hear an occasional speaker, share life experiences, reflect on wisdom gleaned from their past experiences, and discover where God is in their midst. Contact Marvin Breeze. The ROMEOs invite all men seeking friendship and support through life’s changes to join them for breakfast each week at the breakfast buffet in the Hilton Garden Suites at Highway 75 (Central Expressway) and Bethany Drive at 8:00am. Senior women come together at 10:00am on the second Wednesday of each month to enjoy programs, share food, pray for others, and support missions that touch the lives of girls and women. Contact Phillis Eix. 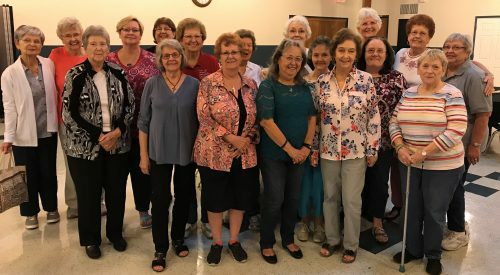 This group meets every second and fourth Saturdays at 6:30pm in the parlor for fun, Christian fellowship, and a variety of games (Mexican train in particular). Contact Rev. Maxie Moore.